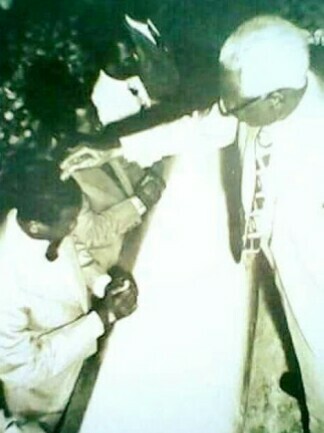 Founder and first General Superintendent of the Redeemed Christian Church of God, Reverend Josiah Akindayomi anointing Enoch Adejare Adeboye during his ordination into the ministry as a Pastor in 1975. Adeboye had joined the church after he had become born again in 1973. The Redeemed Christian Church of God with Pastor Adeboye as General Overseer is today one of biggest churches in the world.